BARQUISIMETO, Venezuela (AP) — Dozens of Venezuelans waited in line outside a chapel in the state of Lara on Saturday, hoping to bid farewell to former major league baseball player Luis Valbuena, who was killed in a car accident along with teammate Jose Castillo. The corpse of Castillo was moved earlier in the morning to a different central-west state. The 33-year-old Valbuena and 37-year-old Castillo were both former players for the Houston Astros. They died late Thursday when their SUV crashed as it tried to veer around an object put on the road. Officials said some bandits place or throw objects on highways to force vehicles to stop so they can rob the occupants. Yaracuy state Gov. Julio Leon Heredia said four people were detained after being found with property of the athletes. Valbuena and Castillo were teammates on the Cardenales de Lara team in the Venezuelan winter league and were returning from a game in the capital when the crash occurred en route to the city of Barquisimeto in Lara. No others details about the incident were available. On Saturday, their deaths caused an outpouring of grief as fellow teammates, family members and fans wore shirts from the winter league and lined up to say goodbye. Retired Cardenales player Robert Perez and Philadelphia Phillies shortstop Asdrubal Cabrera were both in attendance. 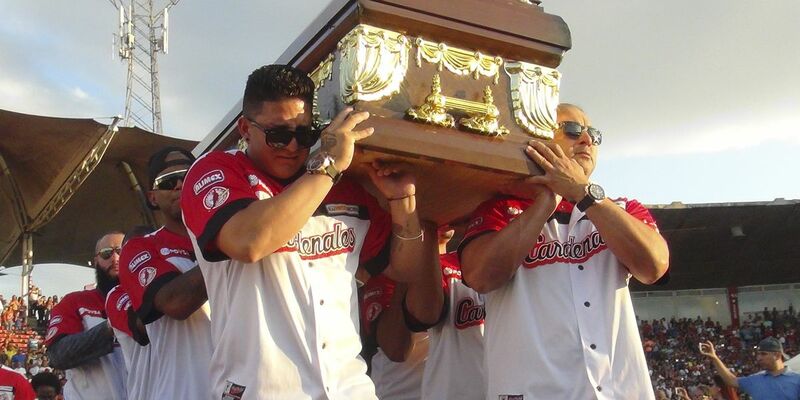 Cardenales third baseman Carlos Rivero, who survived the crash, visited the chapel wearing dark sunglasses and bearing a small bruise on his forehead. Valbuena hit .226 with 114 home runs over 11 big league seasons with the Los Angeles Angels, Seattle Mariners, Cleveland Indians, Chicago Cubs and Houston Astros. Castillo played five seasons with the Pittsburgh Pirates, San Francisco Giants and Houston Astros. He had a .254 average with 39 home runs.